Ditto I think all out kids had the same hat! Ok, those picture made me smile on this rainy, rainy dat. Adorable. 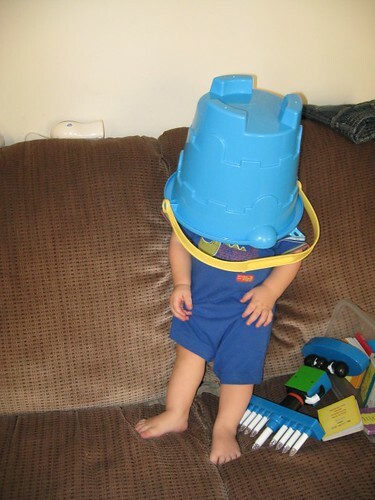 I LOVE those kinds of shots, I have some of my son wearing a bucket hat! Everything can be a hat. 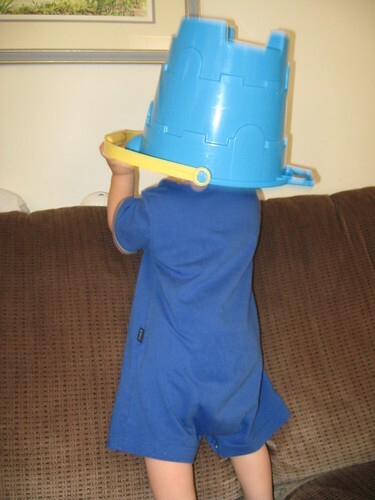 Mine went through a period of even putting pot holders on his head too. CUTE HAT! your kiddos are adorable, btw! Hi, I’m Audrey. I’m finally getting a chance to read all of the blogs from the bloggy carnival and loving what I’m finding. Those photos are just too cute. Kids do some of the darndest things. Your blog is really adorable. What a fashion statement! Great post. Is this a boy thing or what? Taylor does the same exact thing, and he thinks its funny to bump into things while walking around! Oh that’s hilarious. Very cute! He is so cute! It looks like he wore that “hat” for a good long while, too, if you were able to snap a few photos. I’m jealous, by the way, because my toddler won’t wear hats. Or barrettes. Or scarves. Or sunglasses. Nothing on the head, whatsoever. grrr. That is too cute. 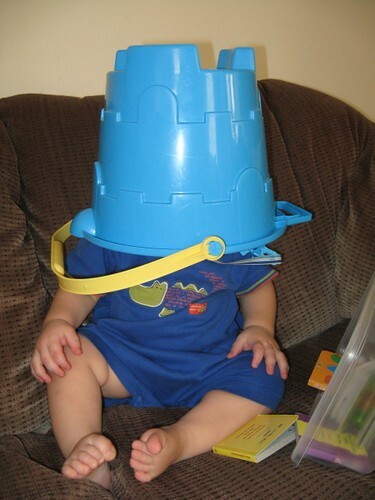 My little one has just started putting his bucket on his head to play his own version of peek a boo. I love they can make ANYTHING into a fashion accessory! Thanks for stopping by the other day; you’re right — Blog the Recession is fun!